By now, Google has your whole life story pegged. It knows what you're typing to friends in Gmail, where you've been and where you're going, what you're searching for on a daily basis, and who you hang out with on Google+. There's not much the company doesn'tknow about you. 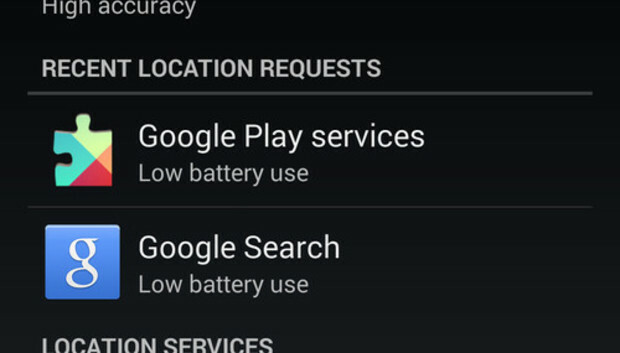 So, to give you more control over which apps collect your location data, and the means by which they do it, Google added in a more obvious Location Services panel in Android 4.4 KitKat. Now you can see what Google is doing with your location information and which apps are requesting that data. It's relatively easy to figure out, but here's a quick walkthrough of what all the settings actually do and how to turn them on and off. On Android 4.4 KitKat, simply pull down the Notifications shade at the top of the screen and select the Settings icon, and then tap the Location icon at the bottom-right. You'll be taken directly to the Location Services panel. There, you can tell your phone was methods to use to determine your location. If you leave it set to High accuracy, your device will use GPS, Wi-Fi, and mobile network towers to pinpoint your location. If you choose Battery saving, you'll only use Wi-Fi and the network for your location. There is also a Device only setting, which only utilizes GPS. If you find that you use Google Maps and its turn-by-turn navigation features often, you may want to consider leaving it on High accuracy for best results. Turn-by-turn directions will still work in the Device only mode, though it's not as accurate. Below that, you'll notice that there is a list of the apps that have most recently requested your location. Selecting them will merely take you to the app's device settings panel. The real important information is underneath each app title, which lets you know how much battery each app or service is utilizing. You'll also notice a Google Location Reporting option. Select it to turn both Location Reporting and Location History on or off.
" Location Reporting allows Google to periodically store and use your device's most recent location data in connection with your Google Account. Location Reporting is a per-device setting.
" Location History allows Google to store a history of your location data from all devices where you're logged into your Google Account and have enabled Location Reporting. The company promises that it won't share the information with other users or marketers without your permission. It also explains that if you've opted-in to Location History in the past, it will use that previously recorded information to suggest locations to you in the future. Turning off Location History will stop your device from recording anything, but it won't delete that past data.